It seems us Android folk can't live without our widgets. Be it Beautiful, Android Pro, or any other that doesn't come to mind, they're one of the more aesthetically pleasing and practical parts to being on Google's team. 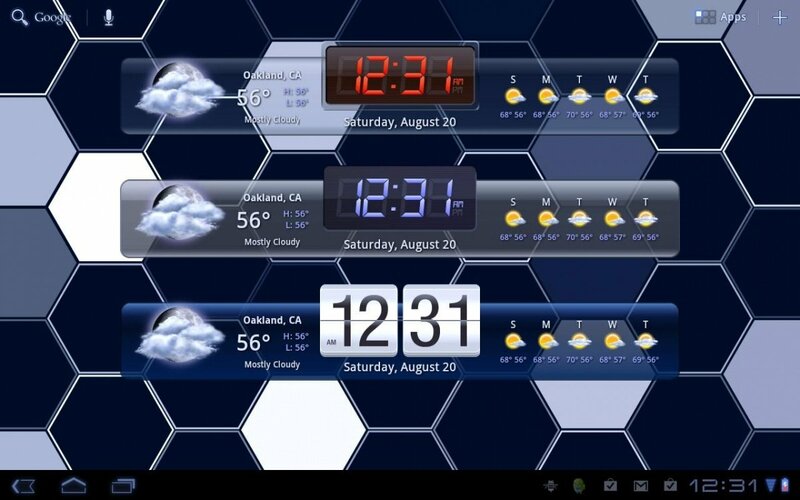 For those who're always looking for the best clock and weather combo on a tablet (a title usually defaulted to Beautiful Widgets), say hello to the newest kid on the block, HD Widgets. 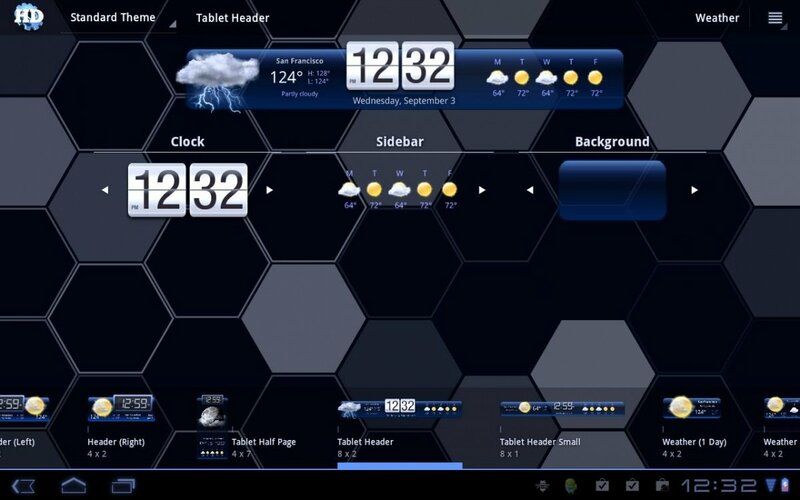 HD Widgets is a tablet-only app that looks to bring some of the visual beauty and slickness most people are accustomed to from Beautiful Widgets. 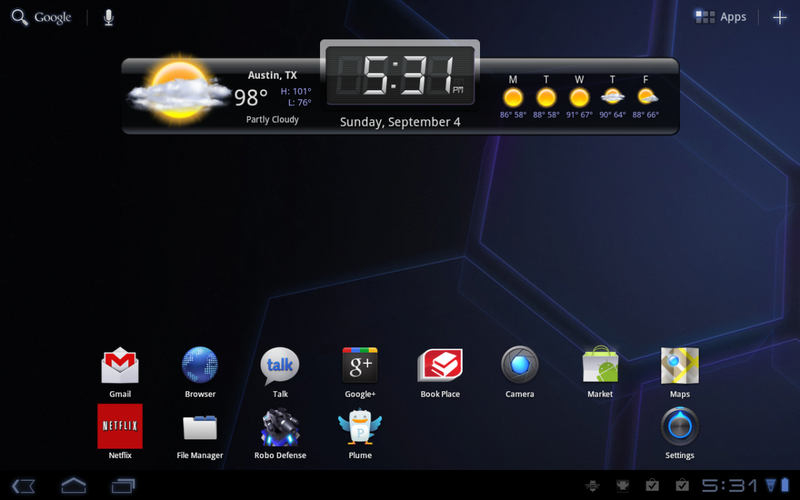 Everything is optimized for the tablet's larger screen, and the results really speak for themselves. 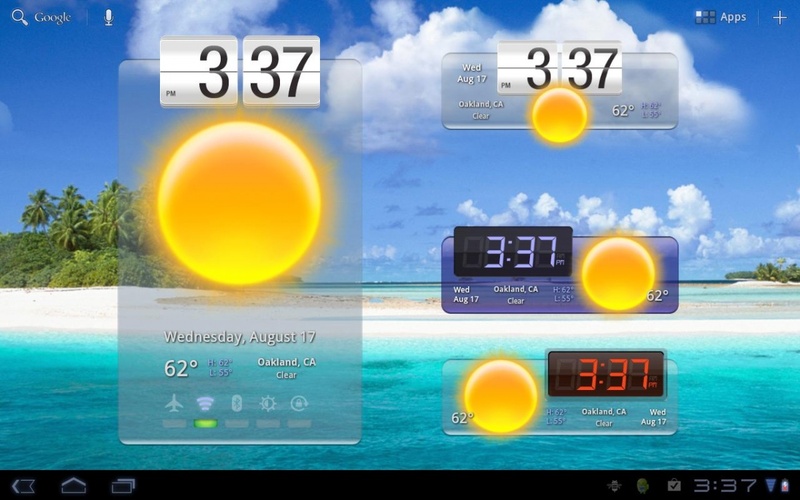 HD Widgets comes with a large selection of sizes to choose from, ranging from full screen to header, half-page, and even weather by itself. 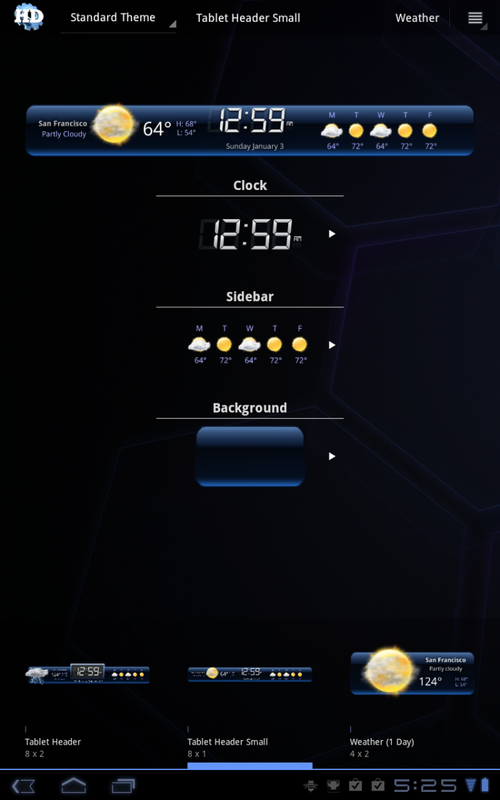 Some options also have a "small" choice, as well, which usually means the clock isn't taller than the rest of the widget. There's also a pretty good selection of clocks to choose from, although the extent is mostly what color and what kind of frame. There's a couple of options as far as font, but if you're not interested in either a traditional digital clock font of a Sense clock, you might be wise to look elsewhere. You can also opt for shortcuts instead of the weather, which includes airplane mode, wi-fi, Bluetooth, screen rotation, and brightness. To top it off, you also get to pick the background. 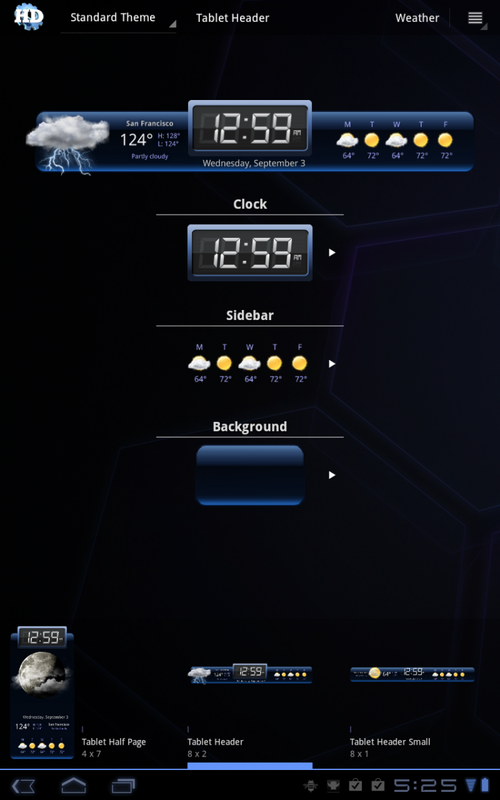 Once you've got your widget customized and placed, you needn't worry about anything else. It'll automatically determine your location (in my case, via wi-fi), and you're good to go. 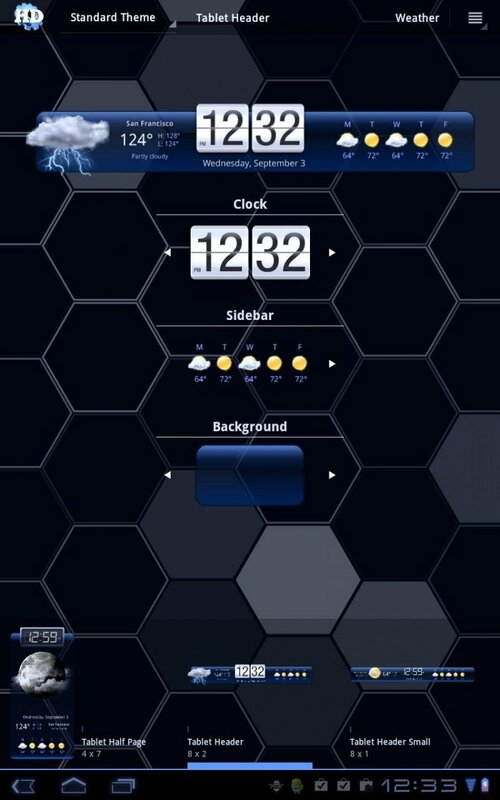 If you're curious about the weather, you can tap the weather icon, and similar to Beautiful Widgets, a full screen weather detail is brought up. 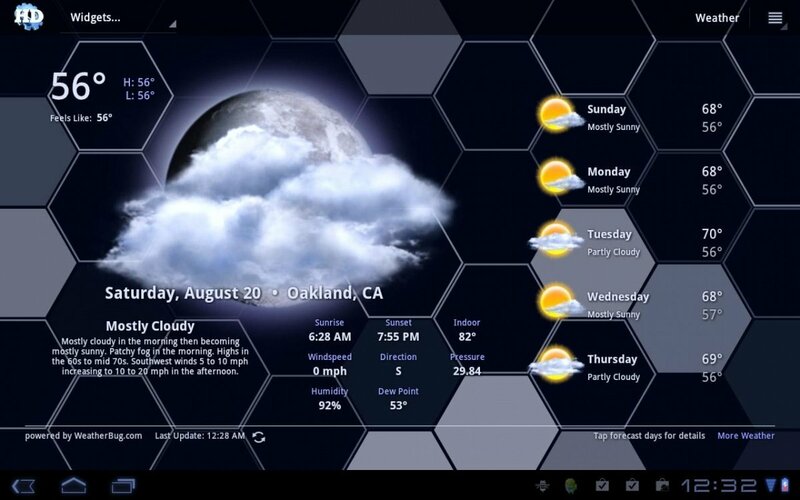 This is where HD Widgets really shines, as it can fully take advantage of the tablet's large screen. Large weather icons are bright and gorgeous, and you're shown really detailed information like sunrise and sunset as well as wind direction and pressure. Your weekly forecast is there, too, with icons and temperatures, just like you'd expect. It's good looking, plain and simple. The only downside of HD Widgets as of now is that you can't download user-made clocks or weather icons, but honestly, with how slick the built-in icons are, I'm not sure you need to. And even then, that's my only complaint. Fortunately, the developers have their emails public and are taking feature requests and ideas, so I know what I'm going to say. 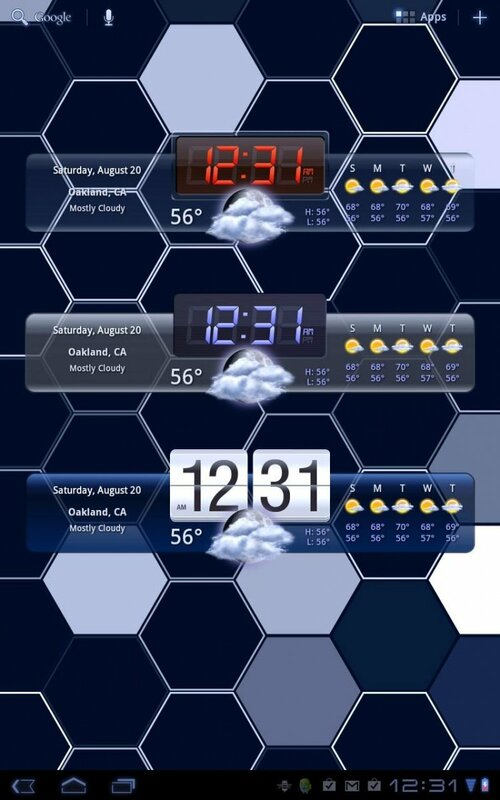 HD Widgets is only $1.99 for now (an introductory price of ~40% off), so if you're rocking a tablet and looking for some absolutely stunning widgets, I'd hope on this sooner rather than later. It's an excellent app that looks like it's only got room to grow, and two bucks isn't bad at all. We've got download links and more pictures (like way more) after the break.